Goodreads recently introduced a neat feature called Ask the Author designed to help writers interact directly with their readers. Ask the Author is the newest service available through the Goodreads Author Program. The program enables writers to create a personalized profile page on the Goodreads site, with an author photo, and listings for all of his or her books. Authors can also embed links to their blogs, event listings, and videos on their profile pages. With the addition of the Ask the Author feature, writers can engage with their fans on a more personal level, by publicly answering questions submitted by their readers. Goodreads initially launched the program with 54 big name authors, but now the feature is open to any author with his or her books up on the Goodread site. Authors can review the questions privately, and decide which ones to answer publicly. 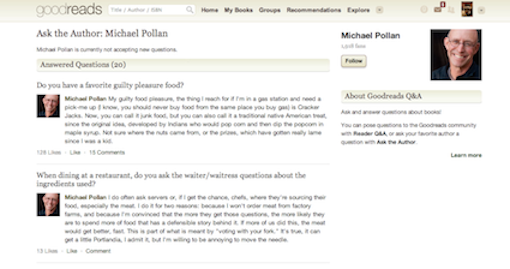 The questions that the author decides to answer appear in the newsfeeds of all of his or her followers, and Goodreads also sends a direct message to the person who posed the question. Authors can leave the Ask the Author function enabled permanently, or set a fixed period of time in which readers can submit their questions. The thing that sets the Ask the Author feature apart from Q&As conducted through Twitter, Google Hangouts or other live online author chats is that Goodreads archives the content, so that people can look up the questions and answers even after the Q&A period is closed. In order to join the Author Program, the author needs to create a regular Goodreads account, and then claim his or her author page. To do that, the author logs into his or her Goodreads account, and searches for his or herself. On the basic author profile page, there is a link at the bottom of the page that reads “Is this you?” Clicking that link sends a request to join the Author Program. Goodreads says that it should only take them a few days to process the request, and then the account will be upgraded to a customized author account, and merged with the regular member page. Once the author’s customized page is set up, he or she can switch on the Ask the Author feature by visiting the Goodreads author dashboard and changing the toggle for Ask the Author to “on”. The feature can always be switched off again at any time by reverting the toggle to “off”. Goodreads recommends that authors only enable the feature when they have the time to commit to answering readers’ questions. You can find more information about how to join, and get the most out of, the Author Program here.